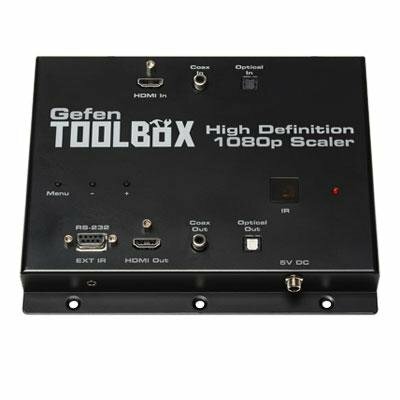 The GefenToolBox High Definition 1080p Scaler allows you to scale one HDMI input to one HDMI output with up to 1080p Full HD and Deep Color. This unit can vastly improve the quality of the image by outputting the video to the native resolution of the display, bypassing the display's internal scaler. Video can be manually scaled up and down in all resolutions up to 1080p Full HD. This product can also be used to downscale, making it ideal for distributing a Hi-Def signal to multiple displays that do not support the same maximum resolutions in an HDMI distribution system, while still showing maximum resolution on the higher-definition displays. It can also be used for DVI signals with appropriate adapters. The GefenToolBox High Definition 1080p Scaler is conveniently wall-mountable so it can be easily installed behind the display. This Scaler offers RS-232 control and is field-upgradeable.